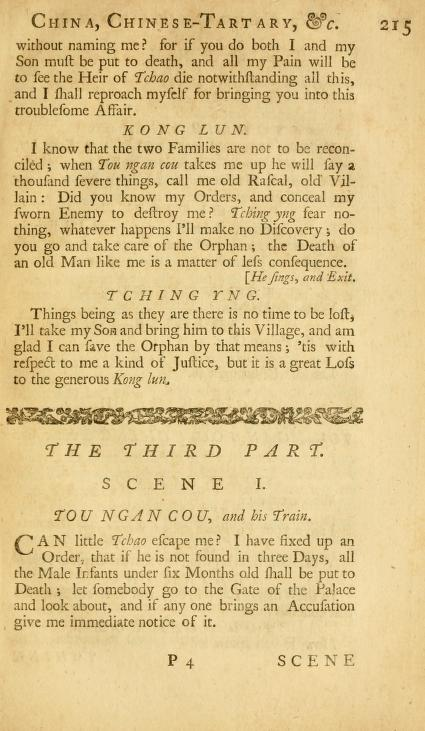 The Orphan of Tchao: THE THIRD PART. TOU NGAN COU, and Train. give me immediate notice of it. TCHING YNG, TOU NGAN COU, and a Solder. Let him be brought in. I am a poor Physician called srching. 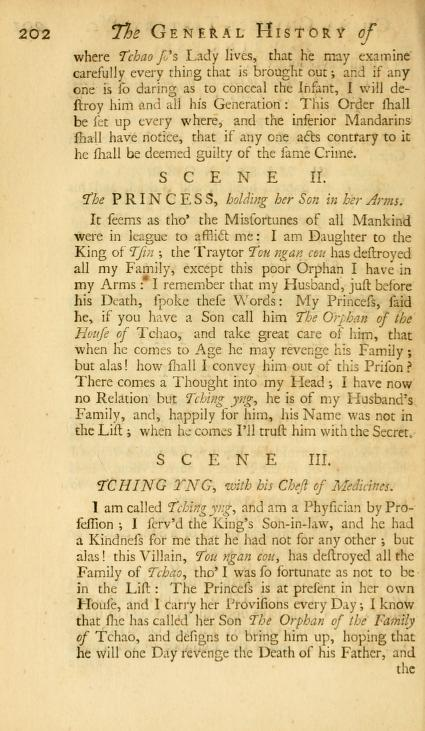 Where dost thou say thou has seen the Orphan Tchao? In the Village Tai Ting, and it is old Kong sun that conceals him. 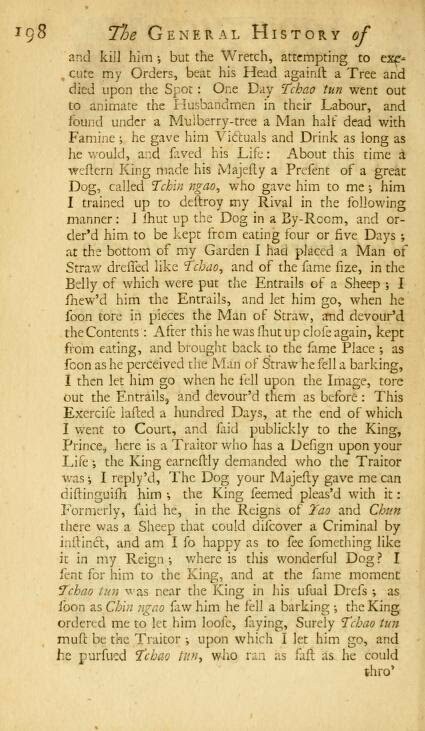 Go Rascal, do you think I shall credit this Story ? in a Falsehood you are a dead Man. and seize old Kong sun. raised! what Company of Soldiers do I see coming! 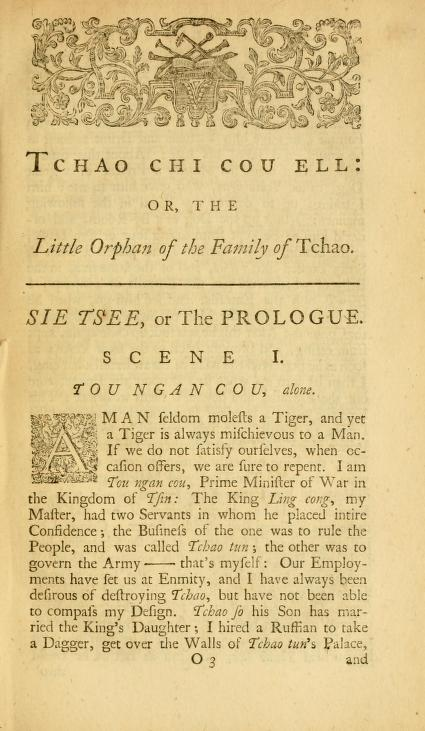 TOU NGAN COU, TCHING YNG, KONG SUN, and soldiers. which is Kong sun's House? do you know your Crime ? I! I am guilty of no Crime that I know of. Remains of the Family ? let somebody take one and lay it on handsomely. Who is witness of the Crime that I am accused of? 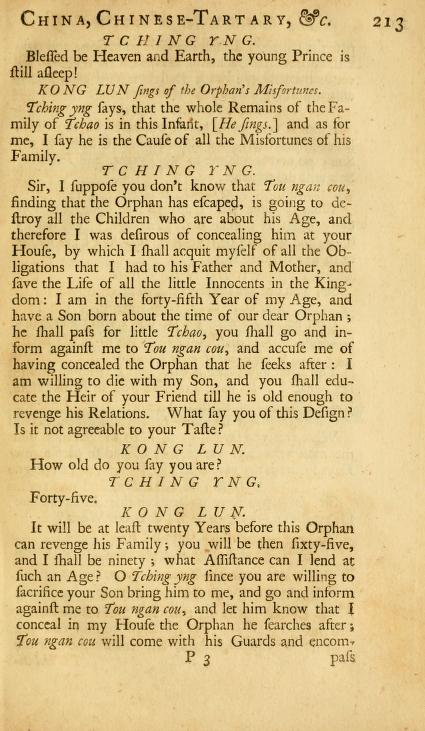 Tching yng was the first that accused the. have put to death more than three hundred Persons? Would you yet destroy a poor Infant who is left alone? Where have I conceal'd the Orphan ? — Who has seen me hide him ? take a Battoon and give him a hundred blows. You are afraid he should discover you an Accomplice. Sir, you shall see me beat him. [Takes a Battoon. must be afraid he should make a Discovery. I'll take one that is larger. Strokes, and then he'll die without making a Confession. know 'tis Tching yng that beats you ? Confess all. [He beats him three times. worst of all ; who gave it me? What, Tching yng beat me in this manner ? Don't mind this old Fellow, he does not know what he says. that you treat me in this manner ? Make haste and confers all. Confess then quickly if you are not willing to die by beating. Well, 'twas thus then, 'twas thus. We consulted both together in what manner to save the Orphan. That is as much as to say he has an Accomplice. you, his Name is -- at the end of my Tongue, but I have sent it back again. Tching yng, does not this affect you at all ? Ah! you old Man, will you slander an innocent Person ? 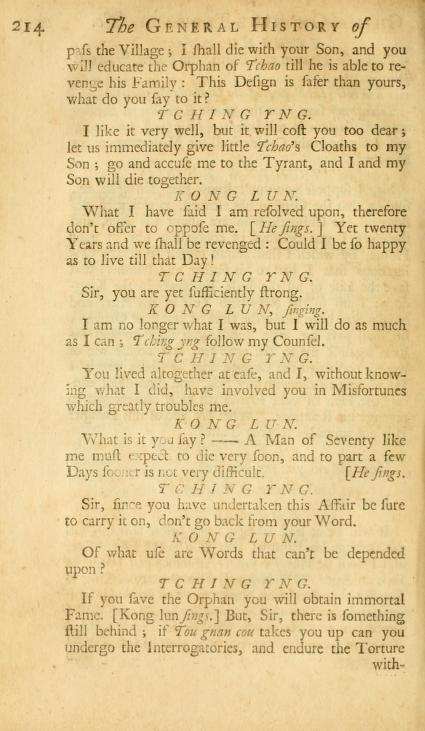 Tching yng, what hast thou to fear ? You mention'd two, why don't you confess who the other is ? You ordered me to be beaten, so that I did not know what I said. If you will not go on you shall be killed in good earnest. My Lord, I bring you good News; searching in Cellar in his House I have sund the Orphan. Orphan — who then is this that I hold ? His barbarous Heart will not be contented without shedding the Blood of an Orphan not many Days old. Now I am at the height Of my Wishes. 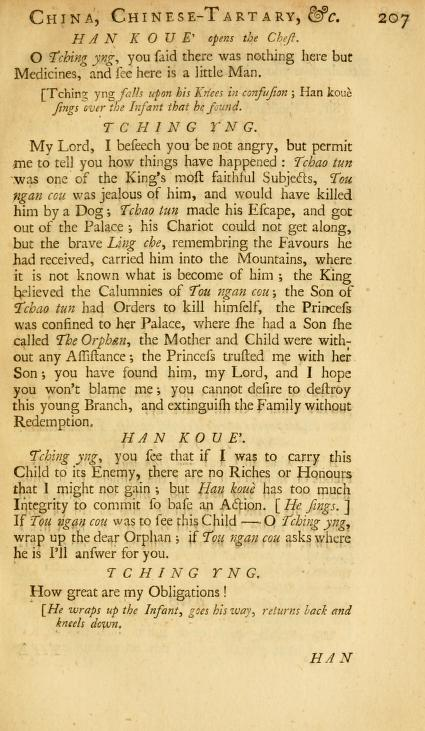 [Kong sun sings, expressing his Regret; Tching yng hides his tears. As for myself I have no Regard for Life, I'll therefore throw myself down this Staircase of Stone, it is the kind of Death that I chuse. Old Kong sun has just killed himself. You have done me excellent Service in this Affair, without you I could not destroyed my Enemy. Kingdom, and among the rest that of my own Child. him: What do you say to it? not worthy of so great an honour. 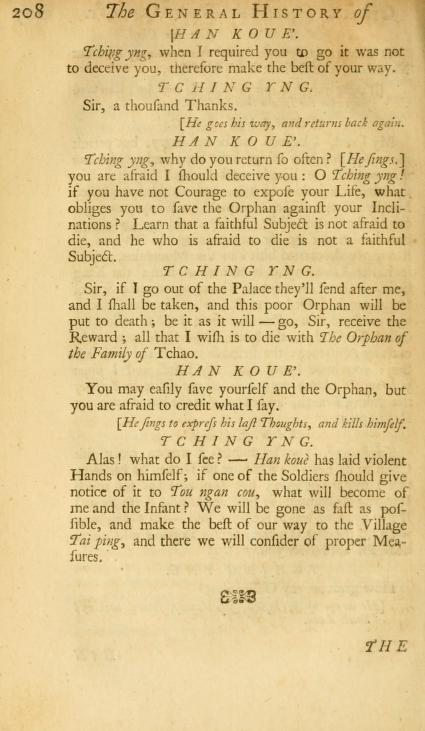 THE ORPHAN OF TCHAO: THE SECOND PART. TOU NGAN COU, attended With Soldiers. lately which makes me uneasy. My Lord, I have very bad News to acquaint you with. Han has stab'd himself with a Dagger. escape the Edge of my Sword. [He sings, the better express his Hatred to Tou ngan cou. 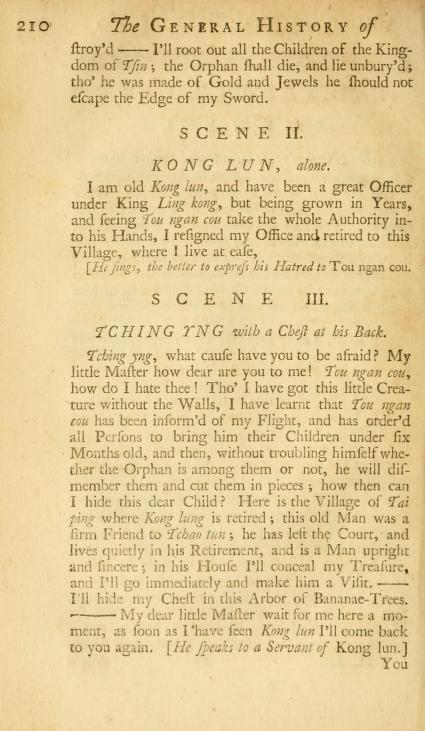 TCHING YNG with a Chest at his Back. and I'll go immediately and make him a Visit. I'll hide my Chest in this Arbor of Banana-Trees. as soon as I have seen Kong sun I'll come back to you again. [the Servant says that is at the door; Kong sun says, Desire him to walk in. My Master desires you to walk in. Tching yng! what Business brings you hither ? am come to do myself the honour to wait upon you. How do all the King's chief Officers since I retired from Court? Tou ngan cou rules all, and every thing is turned upside down. We should all join to let the King know it. 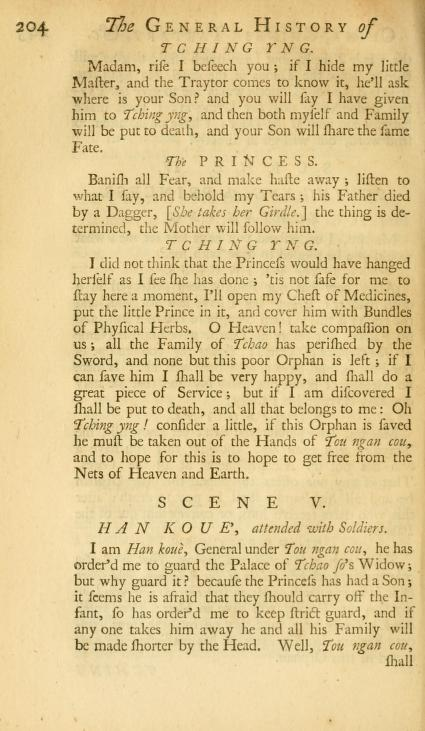 Sir, Heaven has excellent Eyes, Family of Tchao is not without an Heir. 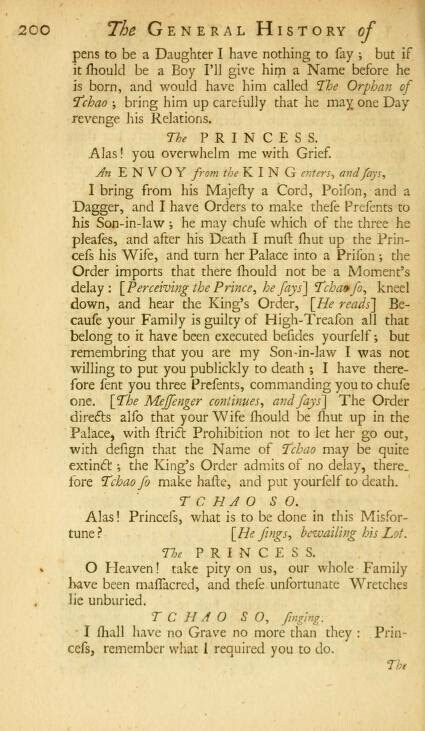 are killed; the King's Son-in-law is stabbed, the Princess his hanged, Where then can the Heir be that you speak of? Where have you left this dear Infant ? 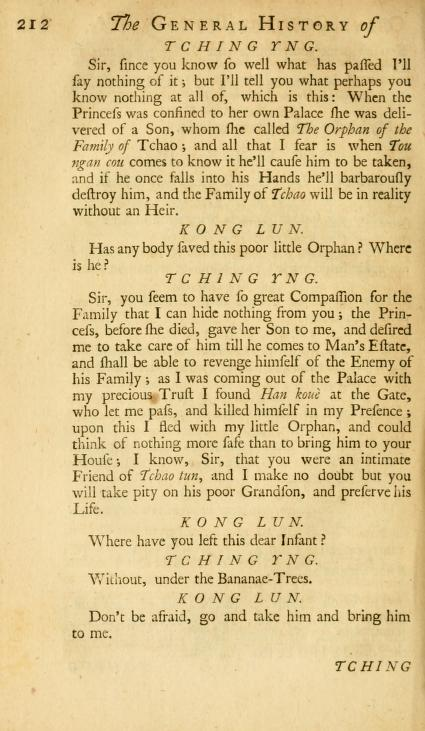 KONG SUN sings of the Orphan's Misfortunes. revenge his Relations. What say you Of this Design? Is it not agreeable to your Taste? How old do you say you are? what do you say to it? Sir, you are yet sufficiently strong. as I can ; follow my Counsel. What is it you say ? -- A man of seventy like me must expect to die very soon, and to part a few Days sooner is not very difficult. [He sings. to carry it on, don't go back from your Word. Of what use are Words that can't be depended upon? an old Man like me is a matter of less consequence. to the generous Kong sun. he shall be deemed guilty of the same Crime. but alas! how shall I convey him out of this Prison ? no Relation but Tching Yng, he is Of my Husband's. Lift; when he comes I'll trust him with the Secret. 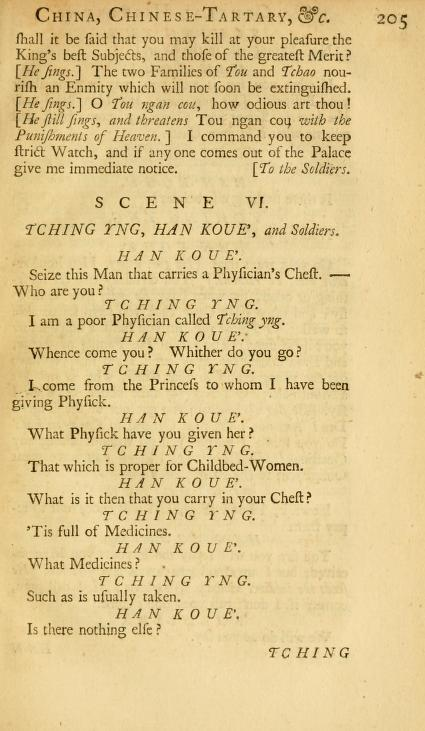 TCHING YNG, with his Chest of Medicines. hardly escape the Talons of the cruel Tou ngan cou. send word, but will go in directly. 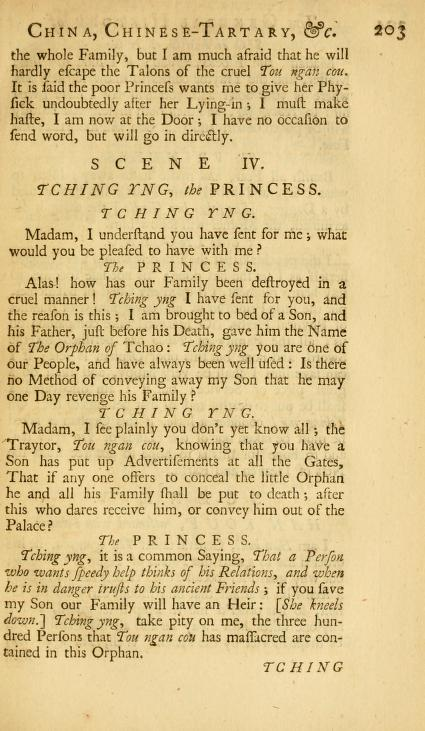 T CHING Y N G.
would you be pleased to have with me ? One Day revenge his Family? determined, the Mother will follow him. Nets of Heaven and Earth. HAN KOUE, attended with Soldiers. King's best Subjects, and those of the greatest Merit? an Enmity which will not soon be extinguished. 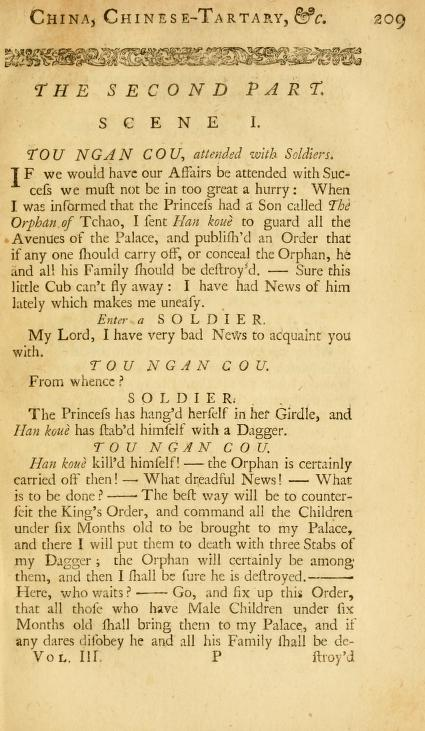 [He sing] O Tou nga cou, how odious art thou! 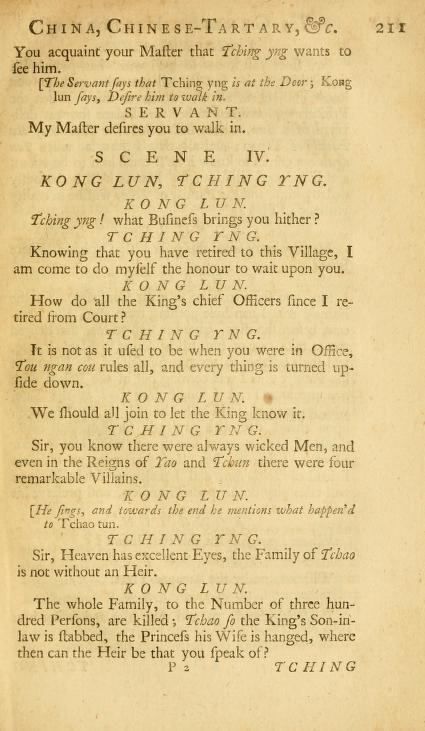 TCHING YNG, HAN KOUE', and Soldiers. Seize this Man that carries a Physician's Chest. 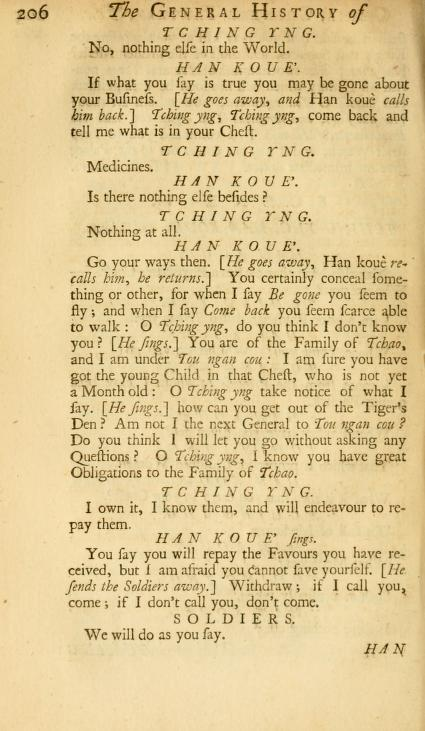 I am a poor Physician called Tching. Whence come you ? Whither do you go ? What Physick have you given her? That which is proper for Childbed-Women. What is it then that you carry in your Chest? Such as is usually taken. No, nothing else in the World. tell me what is in your Chest. Is there nothing else besides? Den? Am not I the next General to Tou ngan cou? 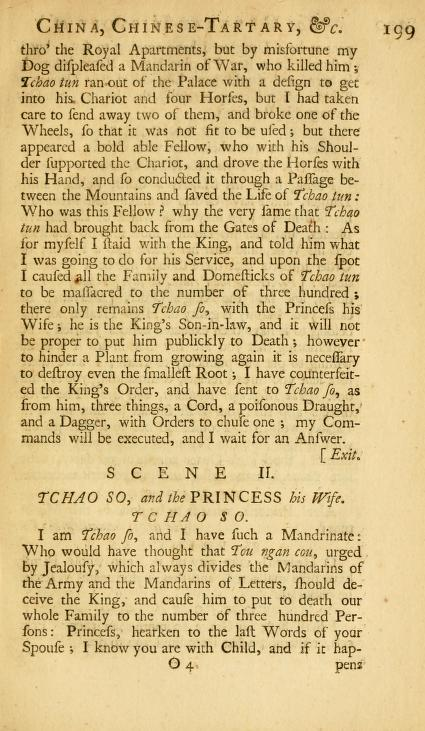 Obligations to the Family OF Tchao. I own it, I know them, and will endeavour to repay them. come; if I don't call you, don't come. HAN KOUE opens the Chest. Medicines, and see here is a little Man. 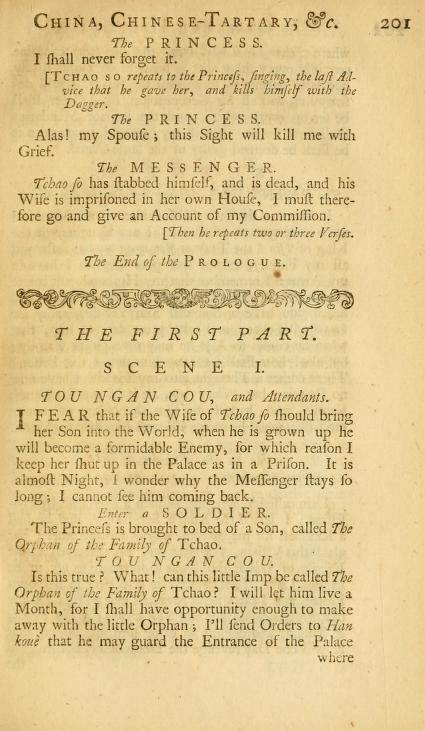 sings over the Infant that he found. Integrity to commit so base Action. he is I'll answer for you. How great are my Obligations ! to deceive you, therefore make the best of your way. [He goes his way and returns back again. obliges you to save the Orphan against your Inclinations? you are afraid to credit what I say. [He sings to express his last thought, and kills himself. Tai ping, and there we will consider Of proper Measures.